Thank you so much @Tony Birt for donating to this project. you have encouraged me to do some more development on this. if anyone has feature requests for the next version I am taking them now. Added a new update. Windows is not able to be resized, and it will not show hidden games. At the moment the database matcher only links them to the correct Games Database Id. to populate the metadata you would need to update metadata and images for the platform and select do not replace any existing fields. Launchbox will download all missing information. I will put a messagebox about this in the next build, I could probably download the information but I dont want to confuse launchbox with what was downloaded from the games database. added a checkbox for automatch. you will be able to disable the automatching feature. added a log file to show you games in your library vs games in the gamesdatabase. Uploaded a new version, this will prevent the bug from happening in the future. it will also fix the ones from the previous version. simply select the same platform again and it will check for games with both a launchboxid and wikiid. Im going to rewrite the code over the weekend. there is a problem with the way I create items. i cannot pass strange characters wich is becoming more and more of a problem. 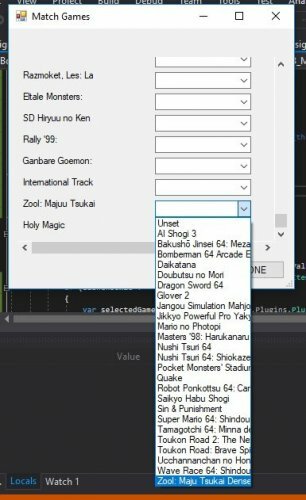 Im going to be rewriting the code to pass the rom id aswell as normalize the game names, hopefully this will fix allot of bugs.